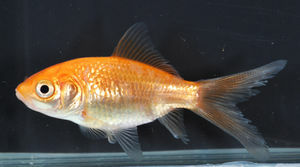 A goldfish that might be sold as a feeder. Feeder fish are a category of fish which are commonly used to feed animals such as large predatory fish, frogs, turtles, and other predatory aquatic or semi-aquatic animals. The most common forms of feeder fish are Guppies, Rosy Reds and Goldfish. These fish are typically purchased in bulk for less then or around $0.10 (USD) per item. Many of these fish will readily reproduce in the home aquarium. A breeding tank for these feeder fish can yield a constant supply of feeder fish for just the cost of filtration and food. Details on breeding a species of feeder fish can be found on that fish's information page. It must be noted that feeder fish must be used with care. Store bought feeder fish are often badly bred and may have diseases and parasites. If you feed your pet feeder fish it's healthier and less expensive to raise your own. Feeder fish should also not be fed as a staple, especially Goldfish as they have a heavy fat content and contain Thiaminase. Freshwater feeder fish must not be fed to Saltwater Fish at any point, they will offer little nutrition to Saltwater Fish and can lead to liver problems. Feeding live fish to another pet is illegal or disapproved of in some countries. Please check your local laws and regulations. This page was last edited on 24 February 2011, at 05:36.